HissTank › G.I. Joe Vintage › Flash-Back Friday! 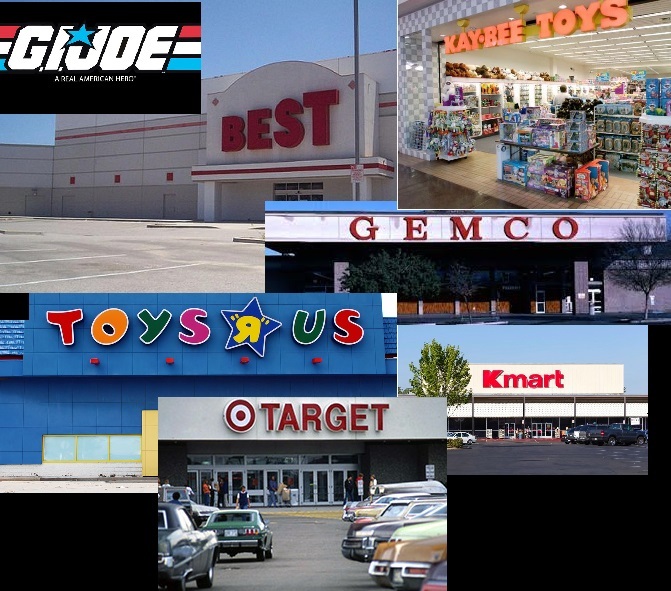 What Were Your Vintage GI Joe Go-To Retail Stores? All the news lately of Toys R Us going under has made me a little more nostalgic than normal (if that's even possible! )Funny thing is, where I grew up, there wasn't a Toys R Us. Of course I knew of them, their commercials, newspaper ads when I'd visit family in states that had them, etc. However my go to stores have always been places like Kay Bee Toys, K-Mart, TG&Y, Best, Gemco, Ace Hardware and, Target. When GI Joe first came out in 1982 I was playing with mostly Star Wars figures. Seeing Grunt and Breaker and how much more articulated they were blew my tiny mind. I was hooked! At this time I was living in Amarillo Texas and all my Joes came from the local TG&Y. My step dad buying me the silver pads Grand Slam in fact. We moved around a lot when I was a kid, so our next stop was a tiny, tiny town of South Fork Colorado. Two towns over was Monte Vista Colorado and Ace Hardware! Most of my 83-84 Joes and Cobras came from Ace! The local grocery store Rainbow Market supplied all my comic needs! From there was Phoenix Arizona and because the town was a bit bigger than South Fork, haha, I had more places to get Joes. Gemco was right next door to my apartment complex and I'd spend my weekly allowance there. This was 1985, so for me it was the best year. We had a strong comic series going that I picked up from the local Circle K as well as a daily cartoon series and some of the best characters in the line. Phoenix was a brief stop for us and we moved back to Colorado, this time to Denver. Even then I do not think Denver had a Toys R Us (1986) but we did have Target, Kay Bee Toys and K-Mart. I spent every dime I had in allowance to get Joes and Cobra. I can remember pining over the Crossfire at the local Kay Bee Toys! Never thought I'd ever get one! I didn't until just last year! 1988 we moved yet again to a suburb of San Francisco. I found a toy store in the Embarcadero Center that I was able to get most of the 88-89 figures and a few vehicles like the Arctic Blast. My folks worked in food management at local malls and on weekends I'd go with them all over Northern California. By 1990 we moved to St Louis Missouri, I was just about to start High School and collecting Joes became what little kids did and I only got a handful of Joes and Cobra and only one single vehicle... the Locust from a local mall. At that point I even got a part time job at a local burger place, Steak and Shake and spent all my money on CDs and batteries for my CD player, haha. I'd like to hear about all your local Joe and Cobra retail haunts! Medford MA and Danvers MA. First it was the Child World on the Mystic Valley parkway in the 80's that sold Diaclone cars. Yes I bought a red sunstreaker pre-transforms. Still have it too. Playing with the displays and having fun. Then they moved the store down the street and when Child World went out of business it became a ToysRUs. EVEN BETTER! I recall walking down the aisles in the late 80's seeing all that treasure like Nightforce joes and dreaming of buying that Night Boomer which ended up on clearance behind the "modern" Joes and Street fighter figs of the time. If only I knew then. Toys was at the mall and of course both were in walking distance from my house. I miss the wall of tickets for NES and SNES games. That will always be iconic for time. For me in Michigan I got my first GI Joe's from Kresge's and K Mart. God do I miss those days of going into a store and seeing full shelf's of toys. Growing up in San Diego...we had all of the major players...Play CO., Kay-Bee, TRU. I found a lot of my Joes at Target but also at Woolworth and Play Co. My mom worked at Target for about a year and so I typically got a new figure at least once every 2 weeks. I remember hunting for about a month to find Alpine...he was short packed in our area for some reason. I grew up in a western suburb of Milwaukee. I remember going to Brookfield Square Mall on the weekends when my mom had to work in an office building nearby. I was 8 or 9, and I'd spend hours in the mall by myself looking at stuff. I remember getting Joes from Woolworth's and Sears. Then they built a stand alone TRU about 300 m away. That changed the game for good. I'd spend many hours there just drooling over the action figure isle. I think KayBee opened up in the mall shortly after TRU was built. I know I got a few joes from there too. First place I ever spotted a GI Joe figure was Gemco. I grabbed Rock N Roll and Flash, and soon worked on getting all the rest everytime I went with my mom for groceries. As a kid here in Cleveland, there was a Best Products right across the street from my grade school that I'd get to go to any time I got good grades, or for having to deal with my numerous doctor's visits. They ended up building a Toys R Us right next to it, but there was already a Children's Palace a half mile away that was my favorite store. The store that was closest to my house though was a Gold Circle that I distinctly remember getting a ton of figures from. My cousin and I were looking at all of them in there once and we both hid Airtight figures because we wanted him, but not as much as the other ones we had picked for that trip. The one I hid fell too far behind a shelf, so I ended up poaching his when I went back! I also got my first vehicle there, a Hiss tank. Other favorites were Kiddie City, Zayre's and Silverman's. I never did get many from Kay Bee because they cost about $3.99 there and everywhere else they were $2.79 or $2.99. Walmart was my go to in Western Illinois. Occasionally local True Vaue. Toys r Us and Children’s Palace and Jacks when we went to the “big city”. Damn dude! You sound like me when I was growing up. Don't know if anyone remembers Service Merchandise. That was my go-to store for Joes. The closest Toys R Us was in Houston but that was an hour away. But Service Merchandise was right there in our local mall which I rode my bicycle to all the time, especially during the summer and Christmas break. I remember in 1985, 1986, 1987, and 1988 Joes had one side of an entire aisle and Star Wars was right across from them holding their own side. I loved seeing all the Joe figures, vehicles, and playsets. Brings a tear to my eye when I think of it.